Following her appearance at the Build Series, Sasha Lane along with Milla Jovovich and Paten Hughes attended the 'Hellboy' special screening yesterday evening(April 9th) at the AMC Lincoln Center in New York. 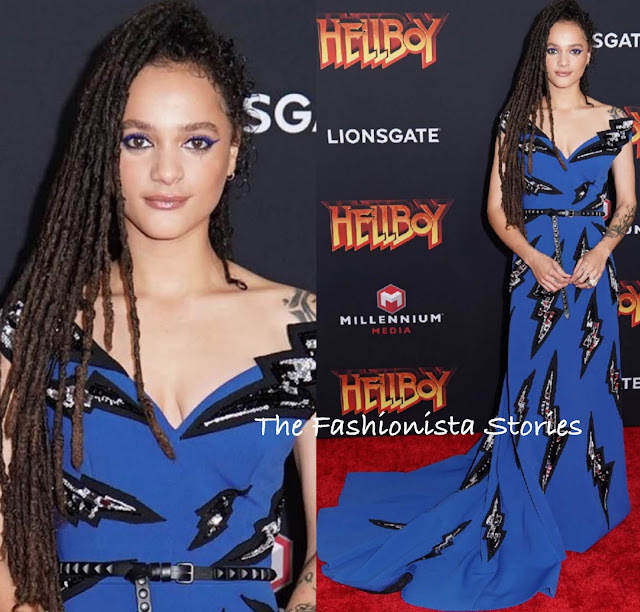 Sasha Lane was easily my favorite wearing this custom PRADA blue, black & silver lightning embellished gown, which was belted at the waist. I mean, she just nailed this look and this is another flawless beauty look. Milla Jovovich stepped out in the ISABEL MARANT SPRING 2019 'Talma' black one-shoulder metallic mini dress, which she accessorized with PRADA earrings and BALMAIN pumps. With such a edgy, sultry mini dress, she needed black strappy sandals to compliment it. Paten Hughes stood out in a yellow satin ALEXANDRE VAUTHIER SPRING 2019 blazer dress, featuring a belted waist and side pockets, which she utilized. If I had to nitpick, I actually wish she wore the boots in the look book, as they would have made a better impact over the black pumps.